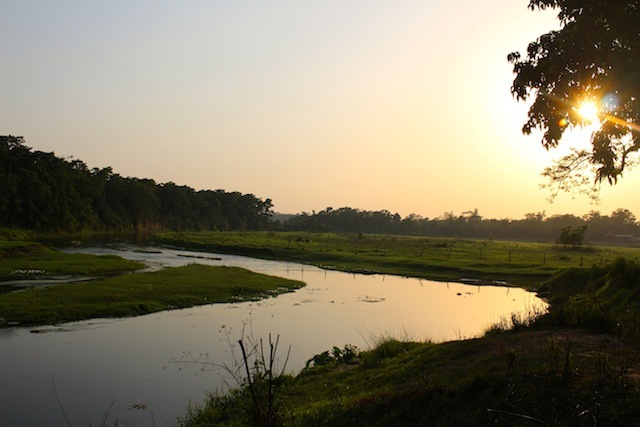 CHITWAN, Nepal, Apr 11 2015 (IPS) - At dusk, when the early evening sun casts its rays over the lush landscape, the Chitwan National Park, a UNESCO World Heritage Site about 200 km south of Nepal’s capital, Kathmandu, is a place of the utmost tranquility. As a flock of the endangered lesser adjutant stork flies over the historic Narayani River, a left bank tributary of the Ganges in India, this correspondent’s 65-year-old forest guide Jiyana Mahato asks for complete silence: this is the time of day when wild animals gather near the water. Not far away, a swamp deer takes its bath at the river’s edge. “The sight of humans drives them away,” explains Mahato, a member of the Tharu indigenous ethnic group who play a key role in supporting the government’s wildlife conservation efforts here. “We need to return now,” he tells IPS. The evening is not a safe time for humans to be wandering around these parts, especially now that the country’s once-dwindling tiger and rhinoceros populations are on the rise. Mahato is the ideal guide. He has been around to witness the progress that has been made since the national park was first established in 1963, providing safe haven to 56 species of mammals. 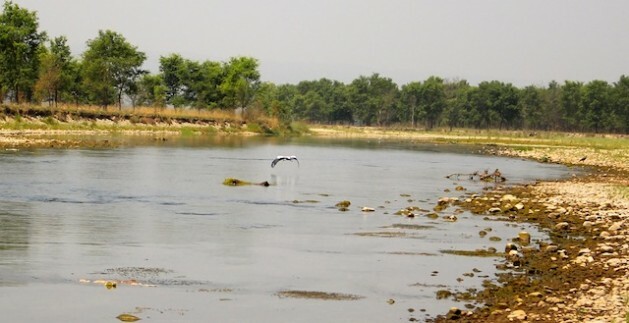 Today, Chitwan is at the forefront of Nepal’s efforts to conserve its unique biodiversity. Earlier this year, it became the first country in the world to implement a new conservation tool, created by the World Wildlife Fund (WWF), known as the Conservation Assured | Tiger Standard (CA|TS). Established to encourage effective management and monitoring of critically endangered species and their habitats, CA|TS has received endorsement from the likes of the International Union for Conservation of Nature (IUCN) and the Global Tiger Forum, who intend to deploy the tool worldwide as a means of achieving global conservation targets set out in the United Nations Convention on Biological Diversity (CBD). Experts say that the other 12 Tiger Range Countries (TRCs) should follow Nepal’s example. This South Asian nation of 27 million people had a declining tiger population – just 121 creatures – in 2009, but intense conservation efforts have yielded an increase to 198 wild tigers in 2013, according to the National Biodiversity Strategy and Action Plan 2014-2020. Indeed, Nepal is leading the way on numerous conservation fronts, both in the region and worldwide. With 20 protected zones covering over 34,000 square km – or 23 percent of Nepal’s total landmass – it now ranks second in Asia for the percentage of protected surface area relative to land size. Globally it ranks among the world’s top 20 nations with the highest percentage of protected land. In just eight years, between 2002 and 2010, Nepal added over 6,000 square km to its portfolio of protected territories, which include 10 national parks, three wildlife reserves, one hunting reserve, six conservation areas and over 5,600 hectares of ‘buffer zone’ areas that surround nine of its national parks. These steps are crucial to maintaining Nepal’s 118 unique ecosystems, as well as endangered species like the one-horned rhinoceros whose numbers have risen from 354 in 2006 to 534 in 2011 according to the CBD. Those like Mahato, for whom conservation is not an option but a way of life, have partnered with the government on a range of initiatives including efforts to prevent poaching. Some 3,500 youths from local communities have been enlisted in anti-poaching activities throughout the national parks, tasked with patrolling tens of thousands of square km. Collaborative conservation has taken major strides in the last decade. In 2006, the government passed over management of the Kanchenjunga Conservation Area in eastern Nepal to a local management council, marking the first time a protected area has been placed in the hands of a local committee. According to Nepal’s latest national biodiversity strategy, by 2012 all of the country’s declared buffer zones, which cover 27 districts and 83 village development committees (VDCs), were being collectively managed by about 700,000 local people organised into 143 ‘buffer zone user committees’ and 4,088 ‘buffer zone user groups’. Other initiatives, like the implementation of community forestry programmes – which as of 2013 “involved 18,133 forest user groups representing 2.2 million households managing 1.7 million hectares of forestland”, according to the study – have helped turn the tide on deforestation and promote the sustainable use of forest resources by locals. Since 2004 the department of forests has created 20 collaborative forests spread out over 56,000 hectares in 10 districts of the Terai, a rich belt of marshes and grasslands located on the outer foothills of the Himalayas. In addition, a leasehold forestry programme rolled out in 39 districts has combined conservation with poverty alleviation, providing a livelihood to over 7,400 poor households by involving them in the sustainable management and harvesting of selected forest-related products, while simultaneously protecting over 42,000 hectares of forested land. Forest loss and degradation is a major concern for the government, with a 2014 country report to the CBD noting that 55 species of mammals and 149 species of birds – as well as numerous plant varieties – are under threat. Given that Nepal is home to 3.2 percent of the world’s flora, these trends are worrying, but if the government keeps up its track record of looping locals into conservation efforts, it will soon be able to reverse any negative trends. Of course, none of these efforts on the ground would be possible without the right attitude at the “top”, experts say. “There is a high [degree] of political commitment at the top government level,” Ghanashyam Gurung, senior conservation programme director for WWF-Nepal, tells IPS. This, in turn, has created a strong mechanism to curb the menace of poaching. With security forces now actively involved in the fight against poaching, Nepal is bucking the global trend, defying a powerful, 213-billion-dollar annual industry by going two years without a single reported incident of poaching, DPNWC officials say. Although other threats remain – including burning issues like an increasing population that suggests an urgent need for better urban planning, as well as the country’s vulnerability to natural disasters like glacial lake outburst floods and landslides that spell danger for its mountain ecosystems – Nepal is blazing a trail that other nations would do well to follow. “Conservation is a long process and Nepal’s efforts have shown that good planning works […],” Janita Gurung, biodiversity conservation and management specialist for the International Centre for Integrated Mountain Development (ICIMOD) tells IPS.